Very disappointing. Most of these are just people who are lousy spellers, all too common and dull. I guess I've been spoiled by Engrish.com. ""I'd be willing to bet that many of these signs would be from people who may not have English as their first language or had access to a fully rounded education." Actually, there are a lot of smart people in the world who do not have English as a first language. Could I see you write that first paragraph in correct Spanish, please? Or any other language that isn't English? I found all the pictures funny but the your title is stupid!!! If I place you in another country where you can't speak the language very well Do you suddenly become stupid ? ""6. 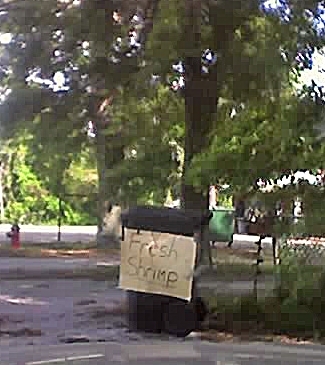 We can't spell either but, come on, that sign's been around for more than just a few days."" Umm. 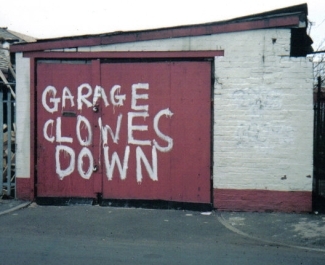 That sign's 'mispelling' was a pun. Hence the over-sized and exaggerated letters. 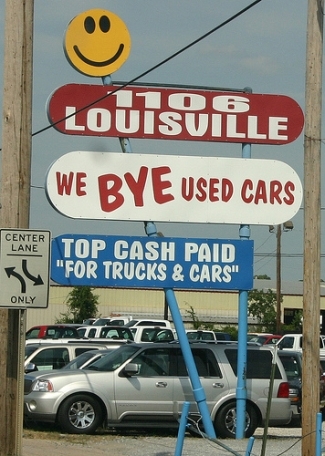 You know.. 'Buy' vs 'Bye', we make it possible to say 'bye' to your old car. As in lots of people are afraid that they will have a hard time getting rid of their old car. 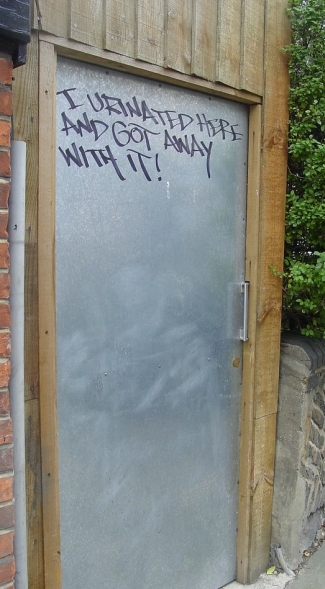 This has been here for years and years in LA in a very wealthy neighborhood. "Stop here, gate will opened automatically". perhaps #3 is where they grow Japanese Privit Trees ( in the Bonsai family). 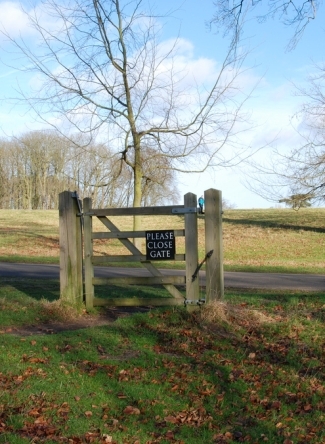 Re #2, you are supposed to close the gate behind you so roaming livestock doesn't exit the pasture. I bet all these have been written by Americans since they have the least knowledge about anything and everything, including english. and they will pay you at the top of that the best prize. nick: Scolding somebody means that you rebuke them angrily, as in "tell them off", "set them straight", etc. It's what an angry parent does when they tell their child to behave. 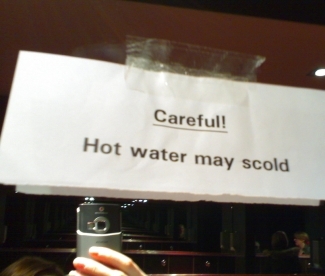 *Scald* is what should have been used in the sign, and it means to injure with hot liquid or steam. Of course, #6 still gets a failing grade for the weird and spurious quotes around "for trucks & cars". Putting quotes around that phrase in that context implies that cash is being paid for something else, something for which the text in quotations is a euphemism. 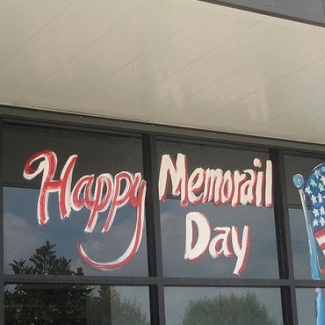 Just yesterday I was driving past a florist that had "Tulip Bookays" written proudly in large letters out front. It took me a while to realize what it meant. LMAOOOOOO!!!!! 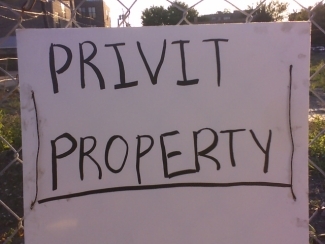 ok, privIt?!?!? Can you say privEt? Ummm, ya...that would be the correct spelling of the definition for a hedge. 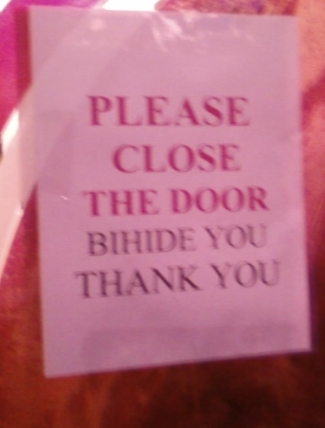 You would think adults would be ashamed of themselves and their inability to spell to at least a basic level. Is this an issue getting worse? If you hear your water telling you you've been naughty, then it's probably time for a nice nappy-poo. Who's a good girl, then? catsby: scald is hot. SCOLD is to berate somebody for doing something incorrectly. So stupid. Get a life. Since when was mispelling (intentional or otherwise) equated to stupidity? If you look at picture number 2 it isn't stupid at all - look closely and you can see the wires from the gate making a fence. 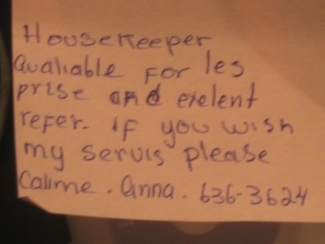 The cleaning lady is clearly a foreigner trying to get by on a no doubt meagre existence in the USA - how well would you do in China or Thailand - or even Mexico?